In 2015, they had 6 million active borrowers impacting 30 million people worldwide with $7.9 billion in their loan portfolio. 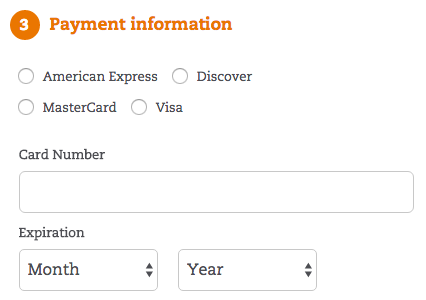 Clicking on the Donate form takes you directly to a donation form. I assume based on this action that Accion doesn’t offer multiple giving funds or options for donors, instead it’s just a general fund ask. 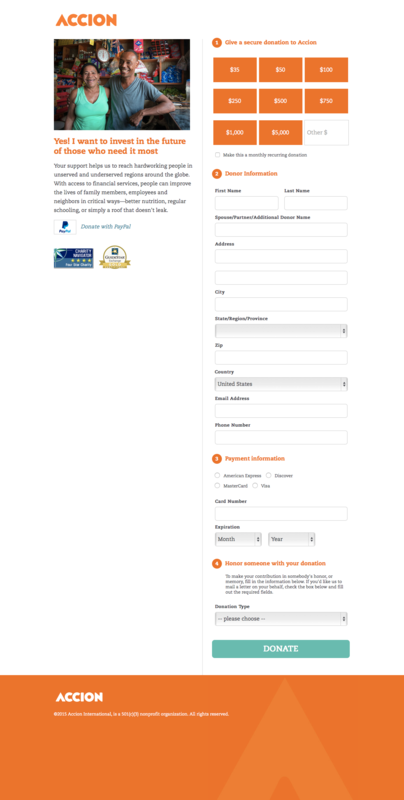 The giving form is long-form and has everything on a single page reducing friction for the donor. At the left is the description of what I’m giving to. 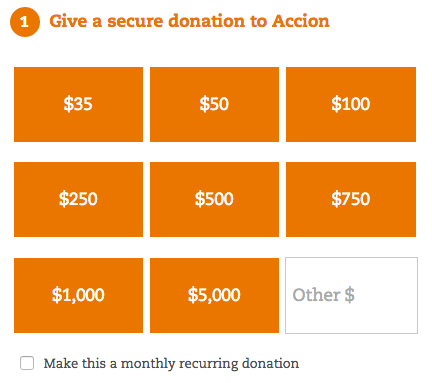 This is a little broad for me – I’m not quite sure what Accion will be doing with my donation. It’s a great picture and I’d love to hear a short story about who they are and how Accion helped them. This “story of the one” would be very effective in capturing the story of one impact made by Accion. There’s plenty of room to pull this off – you have the entire left hand side of the donation form to play with. I’m not sure specifically what “financial services” I’ll be providing people with. Is it a small business loan? A loan to help someone start a garden or fix a leaky roof? I’d like more information about what my donation will be used for specifically. It’s good to give people options for donating, I’d love to know the mix of how many people are still giving via PayPal versus just giving directly on the form with a credit card. The Charity Navigator and GuideStar Exchange icons serve the purpose of adding trust and validity to the organization. Providing quick options for giving is handy for donors, though I believe the number of options is too many. I get option overload when I look at this box. Accion could consolidate a couple of these options and provide 5 options plus “Other” and that would suffice while giving me the feeling of control. This form is long. It would be nice to move some fields onto the same line (e.g. State & Zip) to help reduce the length of the form. 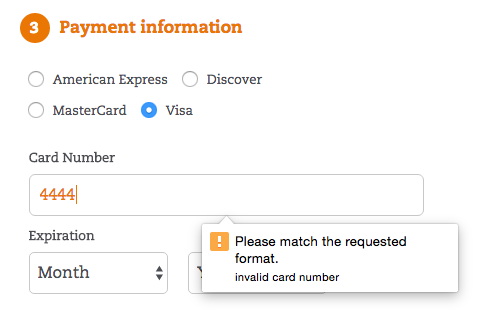 For donors, this is a much better experience than some sites that throw you to an empty form or give you a cryptic error. 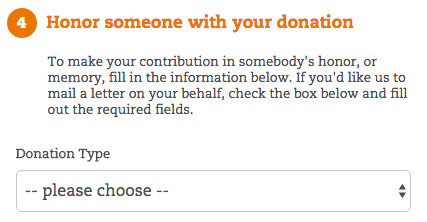 You have an option to honor someone with your donation. I would suspect this is a small portion of your donor audience. 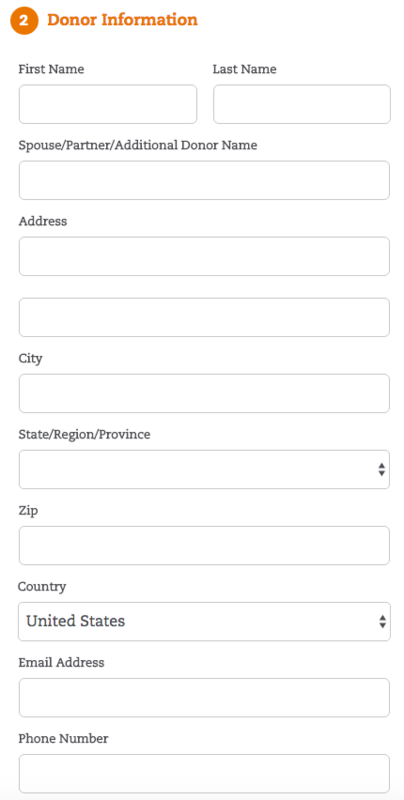 I think adding anything to your donation form should be thoroughly examined and thought through as to why it’s there and if it’s really required. If 1% of your donors honor someone, does it need to be on the form? Can this be accomplished some other way (maybe on the thank you page)? YES! A large call to action button. Love it. Accion thanks the donor and then asks for the next step. Sharing in social media is a great next step for a donor to make and the thank you page makes it easy. I don’t know who Michael Schlein is yet, so having the subject line of “Thank you for donation to Accion” helps easily identify the email. Thank you receipts should be simple and reinforce that my donation is being used to help people. 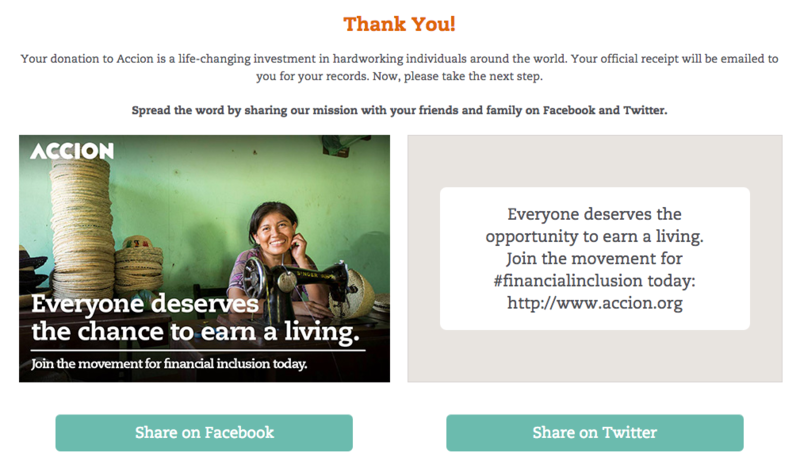 This receipt email is excellent – it includes a story of a recipient and how Accion helped her. One tweak: I would reframe the story to include a line such as “But then a donor like you stepped forward to help Bainabai with Accion training programs …” Reframing the story to make the donor the hero would increase the impact that my donation is being used for good. At the end, I’d add a PS statement to re-present a next step the donor can make. Overall, the Accion donation process is very smooth. As a donor, I’m not completely sure what my donation is being used for – until the receipt email with a moving story about Bainabai. Including this or another story on the donation page will provide an emotional connection to what my donation is being used for.